A gym owner and a well traveled entrepreneur. We are so glad that Johnson took time off his very hectic schedule to share more about himself and CUT Gym. CAN YOU SHARE MORE ABOUT YOURSELF? E.G WHERE YOU ARE FROM ETC. I was born in shanghai in 1989 and moved to Singapore when I was 4 years old. AT WHAT AGE DID YOU BEGIN BODYBUILDING/WORKING OUT AND WHAT MOTIVATED YOU TO KEEP WITH IT? I fell in love with sports at the age of 9, and competed at the national level throughout my school days in multiple sports. By the time I was 16 years old, both of my knees were suffering from tendinitis due to excessive wear and tear. During a period of time when I had to take a break from sports due to my injury, I started going to the gym. Soon after, I was addicted to lifting and transforming my body. My motivation to work out has changed over the years. In the beginning, it was mostly for vanity. I cared a lot about what other people thought of my appearance. I went through stages of excessive eating to get bigger, and excessive dieting to get leaner, both of which had negative effects on my health and mental state. It took me many years, but I’m glad that I can finally view fitness as a lifestyle instead of a tool to please others. Happiness is the key to staying motivated, I believe. If going to the gym or eating right is a chore to you which you have to endure, then you’re most likely going to give up some time down the road. However, if you see it as a simple part of your lifestyle, something you can’t live without – like drinking water or brushing your teeth in the morning, it might just stay that way in your head. WHAT IS YOUR INSPIRATION BEHIND CUT GYM? 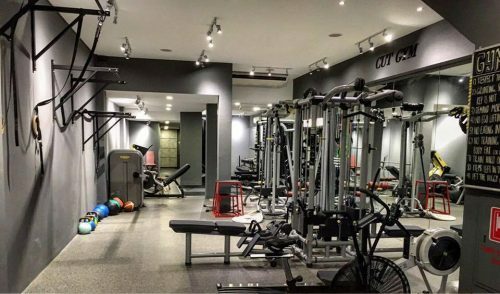 Cut Gym has a wide variety of clients with different fitness goals. But for me personally , cutting fat/weight was an important turning point of my life. I was 108 kg when I was 21 and about to enlist in the army. They sent me to obese camp. How I managed to get that fat in the first place while still exercising is another story – let’s just say that I was in a dark place mentally at that stage. Being in the army with a camp full of other obese people woke me up. I lost 34 kg in 3 months, found my passion for fitness again, and turned my life around. So the word “Cut” means a lot to me. WE ALL KNOW THE IMPORTANCE OF DIET. COULD YOU DESCRIBE THE NUTRITION PLAN YOU CURRENTLY FOLLOW? I tried many kinds of diets to bulk up or lean down. Currently since I’m no longer chasing numbers in my lifts or doing photo shoots any more, I rely on a more well-balanced diet to maintain an active lifestyle and healthy mental state. I eat roughly about 250 g of protein, 150 g of carbs and 80 g of fat daily. I keep my weekday meals as consistent as possible so that I can cheat on the weekends when I spend precious time with family and friends. WHAT ARE SOME OF YOUR DIET TIPS? I always tell my clients, if you want quick results, you will get there with an extreme and strict diet but always keep in mind the consequences. Very strict diets do work for certain individuals who are super strong mentally. However for the most of us, people who have jobs and other responsibilities – people who, unlike a trainer or bodybuilder, do not spend their days inside a gym, it’s hard to keep up with an extreme diet like Ketogenic or 5-6 hours of intermittent fasting over a prolonged period of time. So the key is to find the right balance – a sustainable diet that you can maintain over time. Put in the hard work at the gym and have discipline outside of it to get that physique or fitness you want, but don’t take all the joy out of it. WHAT DO YOU DO WHEN YOU ARE NOT AT THE GYM? I try to travel as often as I can. I like learning new sports, like boxing. I like cafes and chilling with my dogs, whether it’s outdoors or at home. And it makes me happy to be able to do all these, and still consistently put in time at the gym. WHAT ARE YOUR PLANS IN THE UPCOMING MONTHS? Last year was a tough year for my partner and I, juggling time between Cut Gym and our other project, Shotzone. This year, we will try to put our focus on making the gym more inline with our original vision. We want our trainers and facility to be able to provide the highest level of service and satisfaction to our customers. DO YOU HAVE ANY ADVISE FOR ASPIRING FITNESS TRAINERS OUT THERE? Having a first session with a client can be a challenging situation for new trainers. Even after learning the theories and basics from courses or degrees, only real experience will make a trainer more knowledgeable. So there’s no point being stressed about not knowing what to do or what to recommend because experience will come over time. Personality however, is one of, if not the biggest asset that a trainer can have, in my opinion. Being a knowledgeable personal trainer is not enough – knowing how to create and maintain a relationship with the client is more important as that is a huge part of what motivates the client to continue seeing you to reach their goals. So let your personality shine through because if the client doesn’t like you, then more often than not, he or she is not going to stay with you no matter how knowledgeable you are. So be yourself! We thank Johnson for his time, and should you need help with your fitness? Head down to his gym located at Teo Hong Road.